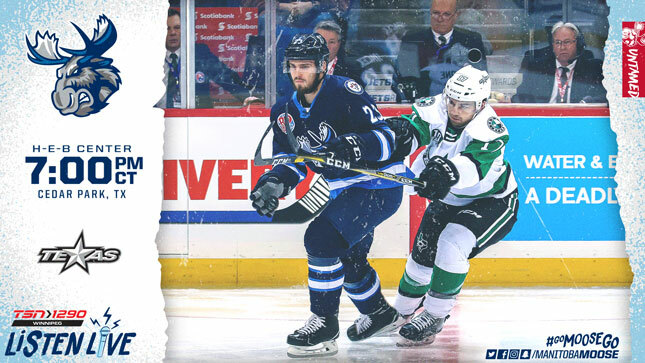 The Manitoba Moose (33-27-4-2) continue their three-game road swing in this season’s final meeting with the Texas Stars (32-29-4-3) tonight at 7:00 p.m. CT. Tune in on TSN 1290, moosehockey.com/listenlive/, the Moose App, or stream the game live on AHLTV. Heading into today’s contest, the Moose have won four of their last five road games including a sweep of the Colorado Eagles on the weekend. As a team who has struggled away from Bell MTS Place this season, getting some points on the road is crucial to making the post season. Six of the club’s remaining 10 games will be played on the road, and all of them are against Central Division opponents. The team’s goal leader, Logan Shaw, spoke about the team finding a sense of joy playing in other cities recently. The Moose have played well against Texas this season, boasting a 5-1-1-0 record against the Stars in 2018-19. That includes getting three points from a two-game series two weeks ago in Winnipeg. The Moose shut out the Stars 4-3 in the first game, then battled back from a 4-1 deficit in the third period to force overtime two nights later. Marko Dano had five points (2G, 3A) in that series and has a four-game point streak against Texas going into tonight’s matchup. With eight total points (4G, 4A), Dano is tied with Shaw (5G, 3A) as the point leaders against the Stars. While Manitoba has pulled off five victories against Texas, five of the seven matchups between the Central Division rivals were decided by one goal. That includes the last game in Texas when Jansen Harkins won it for the Moose in a shootout. 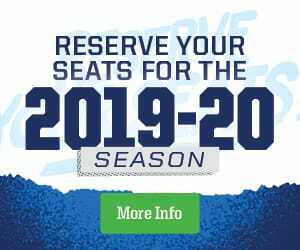 Manitoba will feel comfortable if they’re in for another tight game against the Stars, the Moose are flaunting an impressive 19-6-4-2 record in one-goal games this season. In Saturday’s game in Colorado, it was the defencemen doing most of the damage. Despite the d-men only scoring 15 per cent of the clubs goals this season with 26 total, Cameron Schilling and Tucker Poolman scored all three goals for the Moose including Poolman’s first career overtime winner. The Moose wrap up the road trip with back-to-back games against San Antonio on Friday and Saturday. The team returns home for their final homestand of the season beginning on April 2, against the Bakersfield Condors. Head to moosehockey.com/listenlive/, the Moose App and AHLTV to catch the games live.